With the darker nights upon us, communities across Moray are beginning to see the benefits of the new energy efficient LED units. They give vastly improved colour rendition and greatly reduced light spill, which means they light up only areas which are intended to be lit up and produce a much more even spread of light along roads and footpaths. 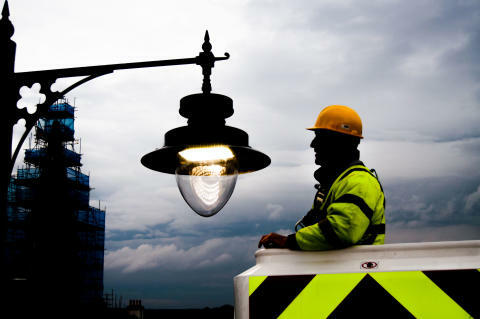 In total, over 17,500 lamps are being replaced over the next five years and the more energy efficient LEDs will reduce Moray Council’s electricity bill by around £20million over the next 20 years as well as reducing carbon emissions by 2000 tonnes. The replacement programme got under way early this year following successful trials in a number of smaller settlements, including Nether and Upper Dallachy, and Cummingston. The council’s roads maintenance manager, Mark Atherton, said that in addition to providing an enhanced quality of lighting, the five-year programme was a sizeable spend-to-save initiative which would have medium and long-term financial benefits for council taxpayers. “Most of the existing street lights emit what we call orange light from bulbs that are expensive to run in terms of electricity consumption. Not only that, manufacturers are gradually stopping making them so spare parts are harder to come by and the lights become more costly to maintain. Mr Atherton said the high quality white light source of the LEDs improved visibility on streets and footpaths with all the benefits that brought in terms of road safety and community safety. The LEDs also had the advantage of reducing light pollution and light spill into windows, gardens and the night sky. “There may be a perception that because the lamps emit a different colour of light, they are brighter, but that is not the case,” said Mr Atherton. Moray Council leader Councillor Stewart Cree said: “This is a classic example of investing money now to save even more money in the longer term. “Not only that, it goes a long way to enhancing the council’s green credentials in reducing carbon emissions and provides communities with better quality street lighting with the benefits that brings in terms of community safety.